Is alimony taxable? This is a question many divorcing women ask. And the answer is that it depends on when the divorce was finalized. For divorces finalized before December 31, 2018, the short answer is yes. For these divorced couples, the spouse who paid alimony could take a tax deduction for the payments. And the spouse who received the alimony was required to count that money as income, paying taxes on it. Alimony payments could also be made non-taxable and non-deductible if both spouses agreed to this arrangement in their settlement agreement. Historically, women have generally been the recipients of alimony awards. Alimony is meant to is to provide income for the lower earning spouse, generally to allow time to develop job skills or to continue the lifestyle that was established during the marriage. According to the Census Bureau, about 243,000 people received alimony in 2017, with 98 percent of those being women. (1) While the majority of alimony recipients are still women, in recent years there have been more men receiving alimony. The Tax Cuts and Jobs Act which took effect on January 1, 2018 is expected to reach virtually every corner of American life—including divorce. In fact, one of the provisions of the new tax plan scraps the tax deduction for the person paying alimony, although the new alimony rules will not affect divorces or separation agreements before 2019. Those who wrote the new tax rules believe the plan provides a higher level of “fairness” to married couples. In fact, the alimony deduction was called a “divorce subsidy” (meaning payments between a divorced spouses would have more tax advantages than payments between married spouses) by the House Ways and Means Committee—the Committee who actually wrote the new tax bill. The Committee’s bigger concern is likely the $6.9 billion in new tax revenue the repeal of the alimony tax deduction will bring in over the next decade. What are the Alimony Tax Changes? In short, any divorce which occurs after the last day of December in 2018 will prohibit the spouse who pays alimony from taking a deduction for the alimony. 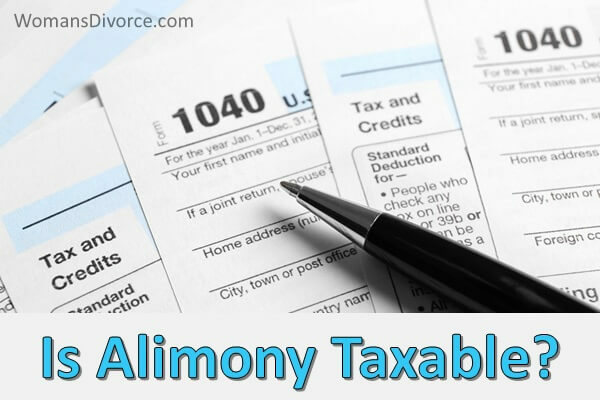 In addition, the receiving spouse is no longer required to declare alimony as taxable income. This is a complete reversal of the former tax laws for alimony in which alimony payments were deductible. Since the spouse who pays alimony is generally in a higher tax bracket, being able to deduct alimony payments often lowered taxes due at the end of the year. Under the old tax laws, the receiving spouse was required to pay taxes on the alimony received. The American Academy of Matrimonial Lawyers (2) strongly opposed the new alimony tax laws, although their protests appeared to have little effect. Those who are experts in divorce believe the new tax rules will make divorce negotiations much tougher, and possibly lead to less spousal support as the money goes toward tax payments. Prior to the new tax law, deducting alimony payments could greatly lower the paying spouse’s tax bill. After the tax law takes effect, there is the chance higher-earning spouses won’t be willing to pay as much alimony without this deduction. Further, the timing of a divorce may well hinge on taxes. The spouse who expects to receive alimony could now have an incentive to delay the divorce settlement in order to take advantage of the 2019 tax benefits. On the flip side, the spouse who expects to pay alimony might try to push the divorce through quickly, in order to take the tax deduction before 2019. Ex-spouses may not live in the same house or file a joint return if the alimony payments are to qualify as deductible. The alimony payments must be made as a result of a written divorce agreement. Only payments made directly to ex-spouses will qualify, although payments, such as mortgage payments or payments to an ex-spouse’s attorney which are considered “alimony,” may qualify if those payments are pursuant to a written divorce agreement, or at the written request of the ex-spouse. All alimony payments must be made in cash, check or money order to qualify as deductible alimony. The Social Security number of the receiving spouse must be included on the paying spouse’s tax return for the alimony to be considered taxable. If the receiving spouse dies, there is no obligation for the paying spouse to continue paying alimony unless state law says he or she must. If state law requires that the paying spouse continue paying alimony to the estate of the deceased, those payments are not tax deductible. Any way you look at it, the new tax laws will have a significant impact on divorcing couples. Those who are planning a divorce should discuss tax issues related to alimony with their divorce attorney, as well as with a tax professional who has experience in divorce tax issues. Should you wait too long, you could end up paying substantially more in taxes—and will live with any mistake made during the divorce for years to come.